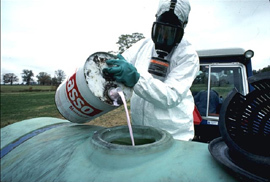 A worker pours pesticide to be used in spraying plants. Farming in America has undergone vast changes since 1950. Perhaps the biggest change in farming has been in efficiency. Scientific and technological breakthroughs have made American farms some of the most productive in the world. Increasing mechanization, the widespread use of pesticides and fertilizers, emphasis on soil management, and industrial farming have made record crop production possible at the same time that the number of farmers has steadily decreased. In the United States, farm production has become more concentrated so that a small number of farmers are responsible for farming huge areas of cultivated land. The number of farms has also decreased as many small farms were bought out and consolidated by larger corporate farming operations. Click on CHARTS, below, for additional information about farms in the United States.